Adult mayflies have 2 pairs of wings that are held over their bodies when they are not flying. The front pair of wings is much longer than the back pair (which are tiny or absent in a few species). Mayflies have 2 or 3 long "tails" that extend from the tips of their abdomens. Mayfly adults do not have functional mouthparts. Young mayflies, called "naiads", are fully aquatic. They are flattened and have 3 hair-like tails on the tips of their abdomens, along with leafy gills all along the sides of their abdomens. Unlike adults, mayfly naiads have chewing mouthparts. As with all insects, mayflies have 6 legs, 3 body parts, and 2 antennae. 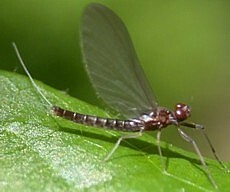 SIZE: Most mayfly adults and naiads are ½" - 1" long. Mayflies have incomplete metamorphosis. Eggs are placed underwater by adult mayflies. After hatching, naiads may live underwater for several years before moving to the water surface to molt into "subimagos." The subimago is a stage in-between the naiad and the adult mayfly: like the adult, it has wings, but it is unable to mate. 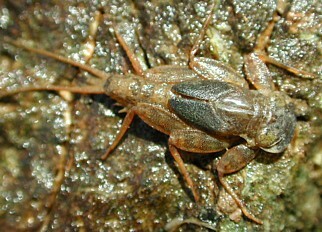 The subimago usually molts into a full-grown adult in a few hours. Adults only live for a day or two, just long enough to mate and lay eggs. Most mayfly naiads are omnivores, feeding on algae, underwater plants, debris, and tiny aquatic animals. They are most commonly found clinging to the undersides of rocks in fast-flowing streams, but a few species are found in ponds and lakes. Although mayflies used to be very common, the naiads are especially sensitive to pollution, and these days they occur only in very clean water. Mayfly adults do not feed, but they are an important food source for birds and fish. Mayfly mating often occurs in a giant swarm, with males using their enlarged front legs to grab and hold females. After mating, females are ready to lay eggs within just a few hours. Mayflies are not normally considered pests. Occasionally, many mayflies will emerge from a body of water at the same time, which leads to piles of foul-smelling mayflies that all die at the same time. There are several common mayfly species in Kentucky, but most are very similar in appearance and behavior. It is difficult even for experts to tell them apart. The mayfly pictured below right was photographed near Laurel River Lake in Kentucky. 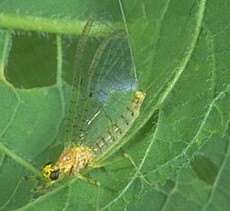 It is a very small species, only about 1/4" long, and is an example of a mayfly that lacks rear wings. Despite their name, mayflies can also be found in June, July, and August (not just May!). Look for them near fast flowing streams and lakes. Mayflies will often come to lights on summer nights if there is water nearby. Because adult mayflies usually emerge from the water at very specific times of the year, depending on the species, they are very common at certain times, impossible to find at others. Mayfly naiads, on the other hand, can be found at almost any time of the year in clear streams. Pick up a rock from a stream, look under it, and you'll probably see a mayfly naiad. Mayfly naiads, like dragonfly and damselfly naiads, should be preserved in alcohol. Unlike some other aquatic insects, mayfly naiads usually do not do well in home aquariums. Most mayflies need running water with lots of oxygen- a condition that is difficult to maintain with an aquarium. Have you heard any myths, legends, or folklore about mayflies? If so, let us know.